Platforms – can’t live with them… pass the potatoes. I know, we all hate platforms. The crux of the problem is explaining what a platform is and how it works, I can write for ages about the details and go into nitpicking details – and never publish. The closest I got to it was the post I did when SFDC announced Salesforce1 (the platform, not the message of a mobile client attempt at confusing users). But the issue remains: how to explain platforms easy and simple? Then, it hit me as I was sitting at conference after conference these past weeks: use examples. I collected some of the most obvious ones these past months and I want to share them with you to try to elucidate on what platforms are and how they work. If there was ever a fool’s errand it is to try to get y’all to agree on what a platform is. I know better than that. However, before we start I want to give you a short version of what I call platforms (and what you should also, if you want to be right… ok, ok, just messing with you…). Some of the critical pars of this definition are: environment, self-contained, and with specific resources to leverage the environment at least as I read it, but I may be biased. Also, by “hardware architecture” I interpret Cloud Computing in the context of this post and my future writings. In cloud computing, a hardware / software architecture combination, the platform is the middle layer that provides essential, secure, scalable, and repeatable services that are then leveraged by the SaaS and IaaS layers to run operations. Think of it as a “traffic cop” that ensures that the right element (data, function, integration point, more) goes where it is supposed and ends up in the right place, after providing it with the right resources to get there. A collection of functions delivered like a service (see some of the examples in the picture above); if you want to call them APIs, do so – but make sure they are open, discoverable, and secure as services at the very least (there is lot more about this coming in future posts). I am in awe of the many versions and approaches I am finding (as well as failed attempts). I will highlight a few, but know that I’m merely pointing you to some of the most mature I found; there are many, many others not included here (I cannot cover everything in one post, sorry). FinancialForce.is a very interesting play on platforms, as they are both an application leveraging Force.com (Salesforce1) as a platform and a platform on their own. Depending on what solutions you implement you are either using a service that is delivered on top of Force.com (Salesforce1) or their own platform that also connects to Salesforce1 (Force.com) to provide additional services. As you see in the chart above, there is an inherent element to cloud-based platforms that is to connect to other platforms and FinancialForce has done this quite well. By establishing these connections between platforms they both deliver a value add via new platform that can easily integrate into exiting ones as well as leverage previous investments the customer may have made. This is the way organizations will leverage the solutions and power provided them by vendors in the cloud: through an aggregation of multiple services delivered by a myriad of platforms providers. The traditional role of the vendor as a seller of software that does everything end-to-end is coming to an end and being replaced by vendors that connect platforms and offer services on top of them. The second example is something that Xactly showcased earlier this year: a new service based on the outcomes generated by the established service they provide. If you don’t follow Xactly they have a service that helps organizations manage their compensation strategies and tactics. They do this by delivering data points showing what others are doing (anonymously) and use that information, together with real-time performance data, to manage compensation for sales people. In a world that is dramatically changing the value and purpose of the salesperson, Xactly offers organizations an easy way to manage their performance and to reward the right behaviors with proper compensation dynamically and flexibly. One of the things that Xactly noticed was that they had access to reams of data about more than compensation: who the people were, how they acted, what they did and didn’t do, what worked and didn’t, etc. All that data started to show insights that were too useful to be abandoned. Xactly at first used them to share with their clients, in a non-methodic manner, as casual insights. Along the way they figured two things: one, the insights could be a product once they figured a method to share them consistently with customers who wanted to know not only how they compared to others, but also what worked and didn’t for others. Second, it was not only that specific data that made sense- but the model. 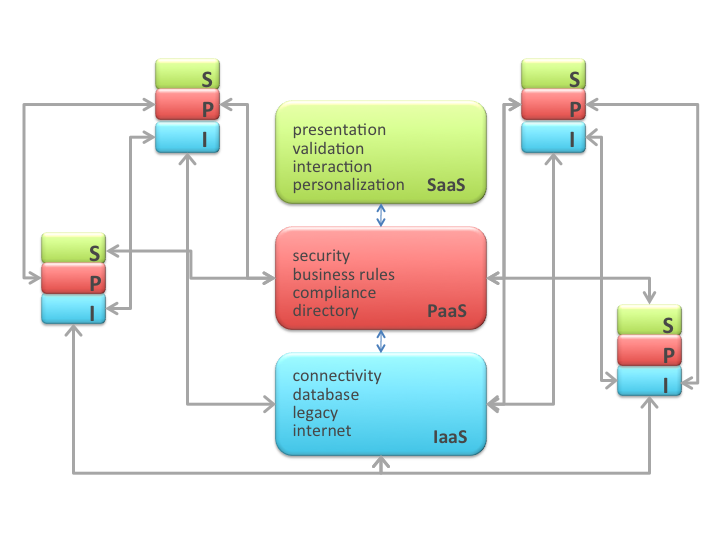 The model of collecting data, any data, from transactions and operations as part of cloud-provided services. This model, together with the data and the insights, became the basis for a new service they provided via their existing platform by simply leveraging the outcomes and the results of the other services. This is what platforms do divinely well and easy: extend what has been done into many different new directions with minimal effort. Another platform example that I noticed recently was Hubspot. At their recent user conference they announced that in addition to the Marketing Automation functionality they were already offering they would begin to offer more basic CRM functionality (related to Sales and Pipeline management as well as contact management). This was partly led by requests from their clients and partly by them noticing that the data was the same and if they could add a few more reporting and operations functions to the cadre of services their platform offered they could extend the functionality of their platform – but more importantly do so in a way that delivered what customers wanted to see. Hubspot focus was not only on the data they could add to their existing database, but more on the functions that their customers could not complete with other offerings as well as extending the functionality of their functional and reporting services. By extending the functionality of their platform (adding new services) they were able to deliver more value to their customers and also showed them how easy it was to do so, enabling future requests for added functionality to come in to them and they can fulfill them – continuing the cycle. One more place where I am seeing the rise of platforms play is in the CRM Idol competition. Now on its fourth year, we are used to seeing the contest showcase the main technical challenges, and solutions, offered by new and starting CRM vendors. During the previous years we saw plenty of focus on social, analytics, big data, marketing automation, and small medium businesses – but this year we are seeing a lot more focus on delivering all these solutions as platforms or even as services for other platforms. While I cannot name names yet (as the contest is still underway and I cannot show favoritism) you can see the list of participants and draw your own conclusions. However, know that I am more impressed by the technology deployment approach via platforms this year than at any other time. Please keep in mind that these are just a few examples of what I am seeing as there are many other plays I didn’t highlight (but will going forward). OK, your turn – flame on (I feel so old saying that)… Troll on… whichever you prefer. Tell me what I missed and what you noticed. Caveat: if you are vendor touting your own solution, likely that your comment will be “spamatized”. disclaimer: as with any post mentioning vendors, I want you to know that FinancialForce and Hubspot were never (or are not now) clients. They either paid expenses for conferences and events, or invited me to dinners and such. Xactly is a current client. Some of the CRM Idol vendors are or were clients also. As always client status is not indication of inclusion, nor is inclusion in this post something I do for them to hire. I’d be very surprised if they were to hire me because of this short mention in a blog post – but stranger things have happened and if this does I will update this post.